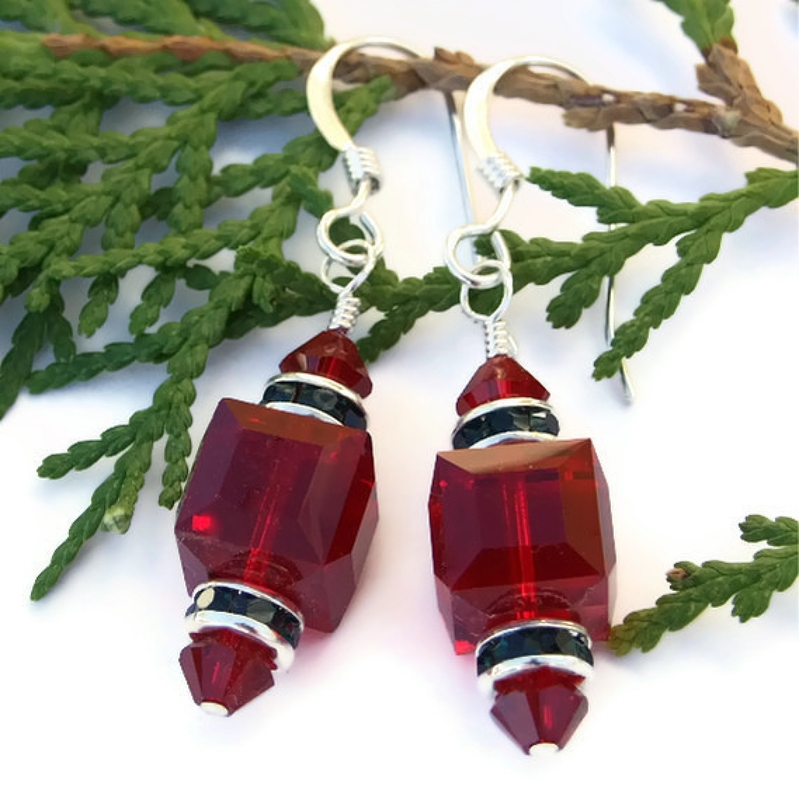 Adding a huge amount of holiday sparkle to your ears, the RED CHRISTMAS Swarovski crystal handmade earrings were designed in the shape of glittering Christmas tree ornaments. Eye catching gorgeous! Perfect jewelry to wear to holiday parties, they are also delightful to wear to work or on casual weekends with family and friends. 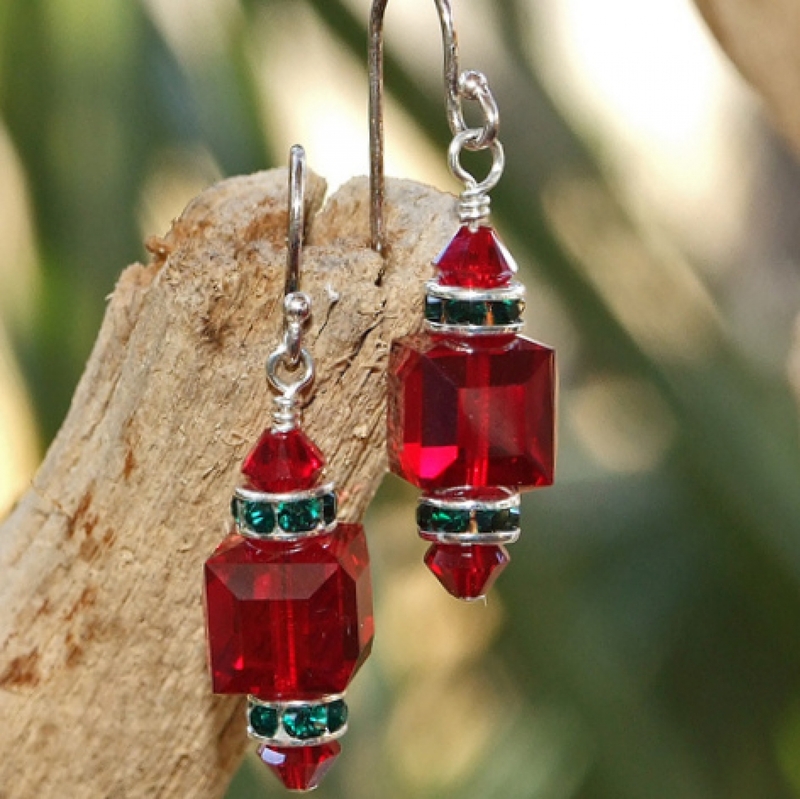 Created with faceted Siam red Swarovski crystal cubes and bicones, the RED CHRISTMAS earrings also feature silver plated Swarovski roundelles set with emerald green crystals. Sterling silver earwires finish the earrings. A "go to" pair of earrings for the holiday season, the sparklies were designed and handmade by Catherine of Shadow Dog Designs. 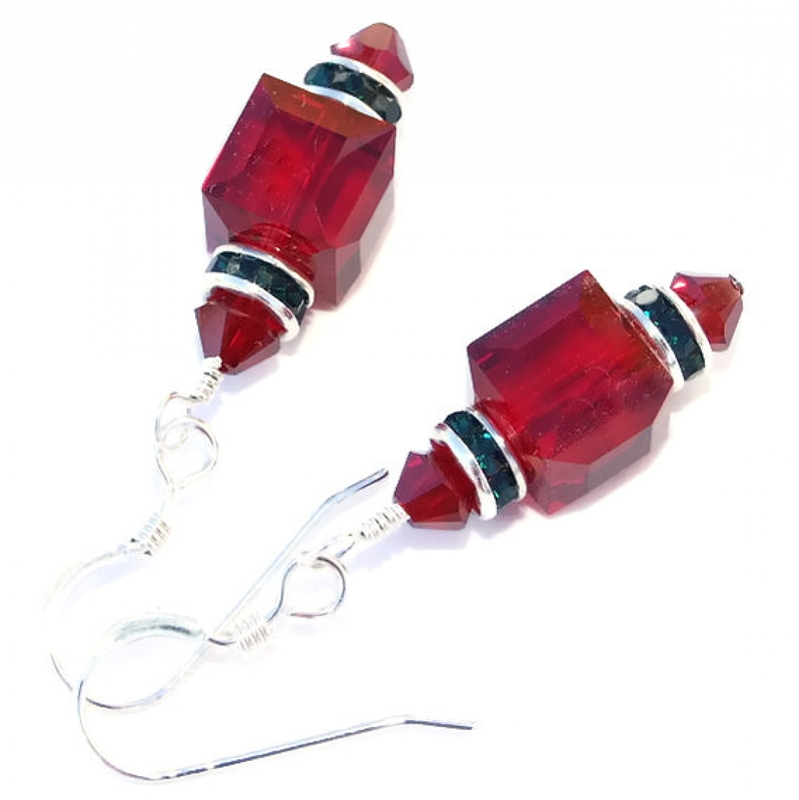 Rich Siam red Swarovski faceted cubes make up the main body of the RED CHRISTMAS holiday earrings. To provide maximum sparkle, the red cubes are faceted on each edge. The second Christmas color was added with silver plated Swarovski roundelles that cap the top and bottom of the cubes. The roundelles are set with tiny, emerald green Swarovski crystals. These crystals might be small but they are BIG on exquisite sparkle. 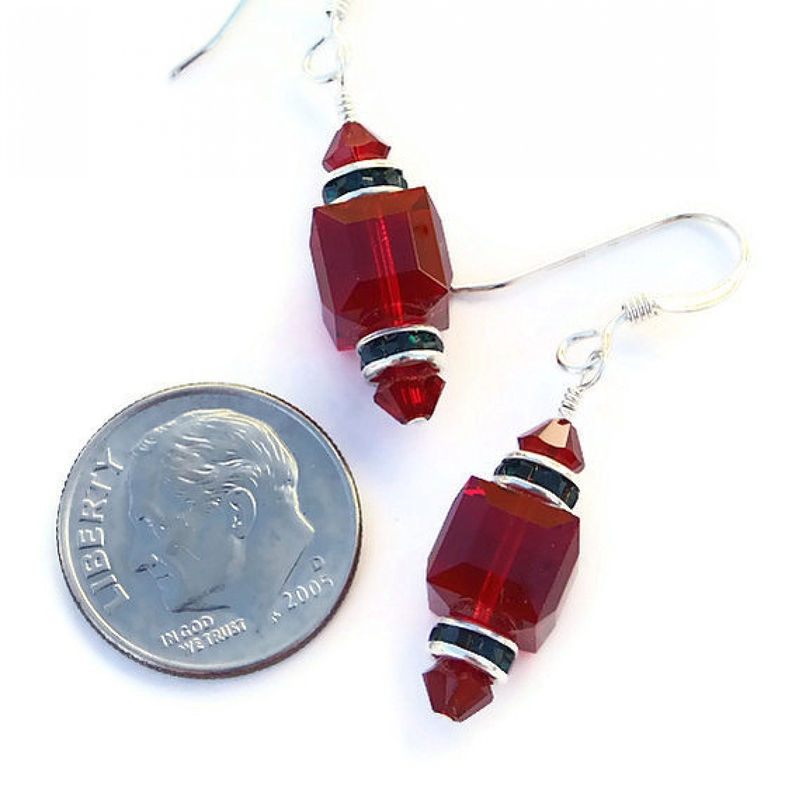 To add even more color to the Swarovski earrings and to finish the ornament shape, 4 mm Siam red faceted bicones were nestled into the outer end of each roundelle. Anyone who is familiar with Swarovski crystals know that they are considered the premier manmade crystal in the world. Swarovski crystal have been manufactured since 1892 in Austria when Daniel Swarovski invented a machine that revolutionized exacting crystal cutting, faceting and polishing. Their exquisite sparkle and flash is mesmerizing, as you will see when wearing the SANTA Christmas earrings. Even though it is man made, crystal (high quality glass) carries the energies of transformation, rebirth and communication. Silver is a metal of love and healing; it is a mirror to the soul, helping us to see ourselves as others see us. 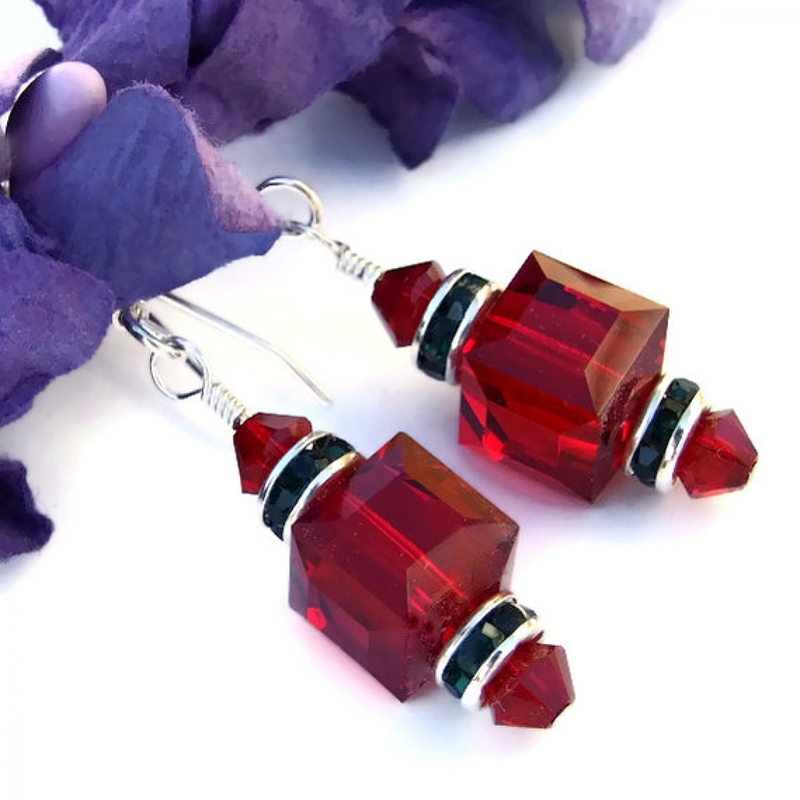 The RED CHRISTMAS handmade earrings will be carefully packed in an organza jewelry bag, perfect for gift giving to a loved one . . . or to yourself!